What lies behind its attractive exterior? If style is a major consideration in your choice of LCD TV, then you've certainly come to the right place. The LE46N73BD is dressed to kill, just like its brothers in the latest wave of Samsung flatscreens, with its great looks, gloss black bezel and a see-through underside wedge. Bigger need not necessarily translate into ugly, as this Samsung oozes class, despite carrying a 46-inch screen in its slender frame. The specification ticks the right HD-ready boxes, with a native resolution of 1366 x 768. The LE46N73BD is also compatible with 720p and 1080i, but not 1080p 'full HD', though. Equally easy on the eye are the connections, including two HDMIs, two Scarts (one of which is RGB-enabled), component video inputs and some impressive multimedia connectivity (like the 10-in-3 card reader that allows you to play back digital photos from 10 different memory card formats). The LE46N73BD's features begin with a digital tuner, which comes with a seven-day Electronic Programme Guide (EPG). Also included is Samsung's DNIe image processing, which claims to improve black levels, colours, motion handling, and noise levels, and the extended Wide Colour Gamut system, which helps the LE46N73BD produce a larger colour range than is usually possible from an LCD TV. The viewing angle is also wider than that you'd find on most other LCD TVs. In practice, the LE46N73BD is a selective beast when it comes to picture quality, and it is much more at home with hi-def material. We set the TV to work with a Sky HD recording of Spider-Man 2 to see how it would cope with some frenetic action sequences and the movie's riot of colour. Initial results impress - colours are rich and lively during brighter sequences, and the level of detail as the superhero webs his way into action is considerable. As Spider-Man goes into battle, the pictures benefit from some cracking motion handling, and darker areas have solid black levels, with thankfully little greyness. All in all, it's a corker of a hi-def picture performance. Unfortunately, it's disappointing with standard-def material. We ran the same test movie from a regular DVD and Spider-Man 2's colours lose their vibrancy, motion smearing is also introduced, and there's a significant drop in sharpness. Flicking through the digital tuner's selection of channels also highlights the same problems. 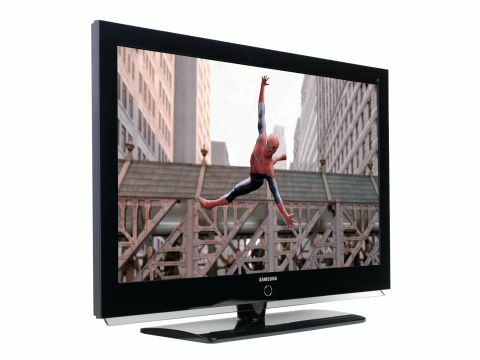 The LE46N73BD delivers a passable performance, but it won't really satisfy viewers of regular TV. The audio department is also a bit of a mixed bag. More subdued scenes in Spider-Man 2 are clear as a bell, but once the action kicks in, the TV finds itself a little bit out of its depth. Bass is in short supply and the overall sonic performance is flat. The hidden speakers and angled reflector may contribute to the stylish nature of the LE46N73BD, but they don't have the power to do the classy hi-def pictures justice. If you're looking for super-value 46-inch LCD TV with first-rate hi-def pictures in an amazing frame, then you've come to the right place. But the LE46N73BD's performance with standard-def material and its below-average sonics let this style star down, so you need to take this into consideration before being seduced by the great looks and price.